Aggressive driving is becoming a common occurrence on American streets. A recent survey found that 9 out of 10 respondents said that they believed aggressive driving was a threat to safety on the roads. The AAA Foundation did a study of 10,000 road rage incidents over 7 years and found that 218 murders had resulted in these cases, and 12, 610 personal injury cases had occurred. Often the reasons behind the aggressive actions are trivial, but they can have serious consequences for drivers on the road. If you or someone you love has been injured as a result of an aggressive driver, call The Edwards Law Firm for a free consultation at 800-304-9246. Our experienced team of auto accident lawyers(http://www.edwardslawok.com/causes-of-auto-accidents.html) can help get you the justice you deserve. Aggressive driving is defined as an action that is performed deliberately with ill intention or with disregard for safety. 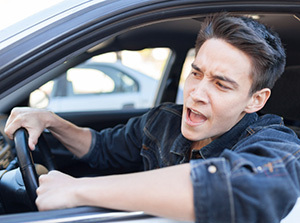 It can include such actions as changing lanes erratically, tailgating, cutting other drivers off during lane changes and other reckless driving(http://www.edwardslawok.com/oklahoma-reckless-driving-accident-lawyer.html) behaviors. However, some aggression can extend to physical contact or following someone home to continue the conflict. In some cases, the aggressor may be so deeply involved in extracting revenge that he or she causes injury to bystanders, causing many aggressive driving lawsuits each year. If possible, dont engage the violent person. Try to put distance between you and the aggressive driver. Avoid making eye contact or gesturing in any way. Even small reactions, such as rolling your eyes or shaking your head, can set off an hostile individual. If the aggressive individual follows you, drive to a well-populated area or call the police. Do not go directly home if someone is following you. Avoid one-on-one confrontations where there are no witnesses. If you have been involved in an aggressive driving accident, get experienced legal help from our auto accident injury lawyers.